Gip Barnell, age 91, of Aurora, passed away Thursday, July 27, 2017, at Memorial Hospital. A Memorial Service will be held 10:30 A.M. Thursday, August 3rd at the Presbyterian U.C.C. Rev. Bruce Bradley will officiate. Inurnment will be in the Aurora Cemetery. Visitation will be from 5 - 7 P.M. Wednesday at the Presbyterian U.C.C., 930 K Street, Aurora. Memorials may be made to the family to designate at a later date. Higby-McQuiston Mortuary is in charge of arrangements. Condolences may be e-mailed to the family through the mortuary website at www.higbymortuary.com. 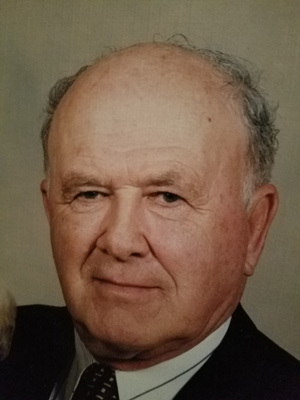 Gilbert ‘Gip’ George Barnell, the son of George and Anna T. (Anderson) Barnell, was born in Sutton, Nebraska, on May 14, 1926, and passed away in Aurora, Nebraska, on July 27, 2017, at the age of 91. He grew up in Sutton and graduated from Sutton High School. Gip served in the U. S. Navy during WW II. He served aboard the U.S.S. Geneva and the U.S.S. Agawan. Gip was honorably discharged in June of 1946. On August 17, 1947, he was united in marriage to Shirley Grosshans, his childhood sweetheart. They lived in Lincoln while Gip attended UNL. Following graduating from UNL with a B.S. Degree in Business, they moved to Aurora. Gip went to work for his father-in-law, Arthur Grosshans, in the International Harvester – General Motors Business. He was a sales manager for 25 years. After selling the business, Gip got a Real Estate Broker’s License in January 1975 and stayed in the real estate business until retiring January 1, 2000. Gip and Shirley were married for 70 years. Gip was a member of the Presbyterian U.C.C for 65 years and served on the council and special committees, the Masonic Lodge for 50 years, a lifetime member of the American Legion, past president of the Aurora Country Club and served on the Board of Directors for Blue River Valley Realtors Association . He enjoyed collecting stamps and coins and had many years of hunting, golfing and fishing. He always owned a hunting dog and raised racing homer pigeons. After retiring, they enjoyed traveling, friends, family and hobbies. He never was bored. “When you live in a small town somebody always finds something for you to do.” Gip loved and enjoyed his family and grandchildren, and his many friends. He was preceded in death by his parents; daughter, Barbara Anne Manley and brother, Hollis Barnell. Those who remain to cherish his memory are his wife Shirley of Aurora; son, Randy Barnell; four grandchildren, Brock Manley, Joshua Barnell, Zachary Barnell and Angela Barnell; seven great-grandchildren, Joey Dowell, Isabel Barnell, Madison Manley, Joseph Barnell, Jordan Barnell, Alayna Barnell and Annabelle Manley; brother, Dean Barnell and many other family members and friends.